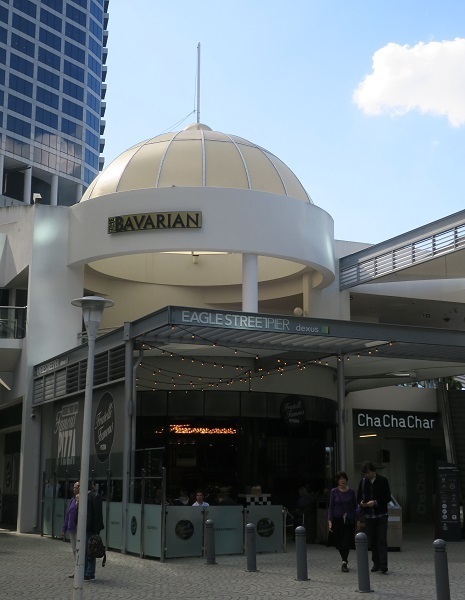 Nestled amidst the high-rise offices and apartments in Brisbane, you can spot some delightful domes and curious cupolas. A simplistic dictionary definition of a dome is: "a rounded vault forming the roof of a building or structure, usually with a circular base". But it can also be just a thing shaped like a dome or hemispherical shape. Here is my ABC (and DE) of a dozen domes. These first four domed buildings which I have chosen are of exceptional interest architecturally and are of significant historical value. They are all located in the CBD and are within an easy walk of one and another. 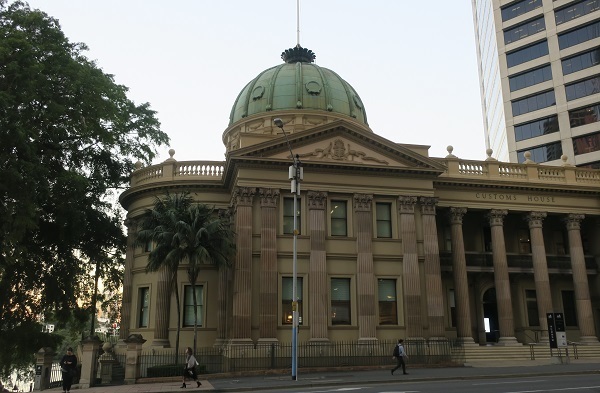 I have to start with the Brisbane City Hall, not just because it is Brisbane's favourite building, but because it has the largest copper dome in the Southern Hemisphere, at 31 metres in diameter. It is supported on a brick base that allows the interior – the Main Auditorium below – to be unobstructed by columns. 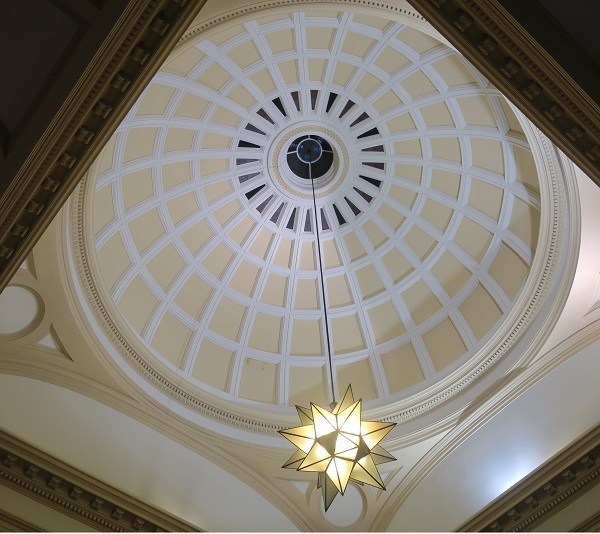 Its circular design was based on the Pantheon in Rome, which was the largest dome in the world for more than thirteen centuries. The copper on City Hall's dome, all 30 tonnes of it, was replaced in 2003 as it was tearing at its seams. 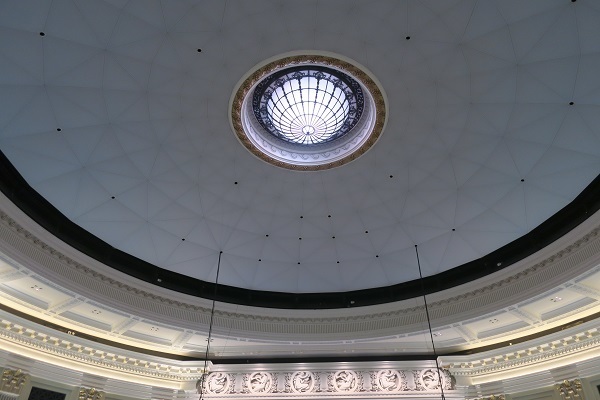 On the third floor near the entrance to the Museum of Brisbane, a viewing area provides a close-up look at the dome. The eponymous "Dome Lounge" in the museum offers another splendid vantage point and excellent photo opportunities. The City Hall was opened in 1930 and is a great example of neo-classical architecture and is one the finest civic buildings in Australia. It was designed by Brisbane architects TR Hall and GG Prentice. The original design drawings by the architects are displayed in the hall's corridors on the ground floor. The construction of the building in the 1920s was a major undertaking and ranks second only to the Sydney Harbour Bridge. In addition to the City Hall's huge copper dome, the clocktower sports a gorgeous green decorative cupola cap. The Queensland Government built Customs House on the river to collect customs and excise duties, mainly for food and manufactured goods, at the busy port of Brisbane in the late nineteenth century. This majestic building on Queen Street was designed by Charles McLay of the Colonial Architect's Office and completed in 1889. It's a fine example of the Victorian free classical style with its imposing Corinthian columns and dome. The grand public space of the "Long Room" is surmounted by the building's huge copper-sheathed dome with its distinctive green patina. Built in a cruciform, each section across is 23 metres long and the height of the dome is 19.5 metres high. It is one of Brisbane's best-known buildings and a prominent feature on the river landscape, despite being overshadowed by modern high-rise blocks, many of which are devoid of architectural merit. This masterpiece of colonial times is now leased by the University of Queensland and is a cultural, educational and heritage facility. Naldham House at 193 Mary Street on the corner of Felix Street, is dwarfed by new glass tower buildings. The aged verdigris dome is reflected in the many windows surrounding it. 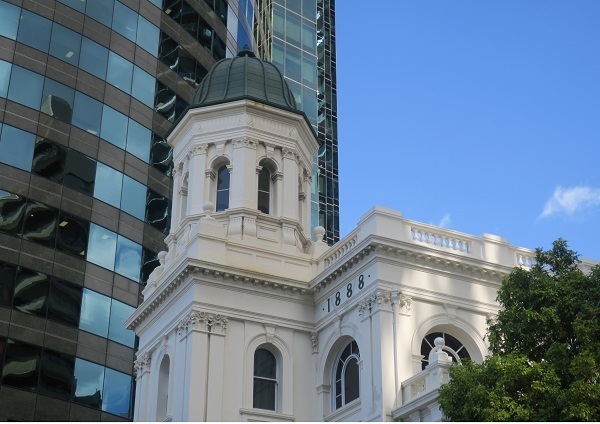 The current building, designed by architects McCredie & Co, was opened in 1888, making it the same era as nearby Customs House. The most distinctive architectural feature of the building is the octagonal tower with cupola - the dome-shaped ornamental structure on the roof. For a century this opulent mercantile building served as a major shipping office. Its curious name was derived from MacDoNALD and HAMilton who were agents of the Australasian United Steam Navigation Co. It was the site of the First Russian Consulate, following the appointment of Benjamin Wickham MacDonald to the position of the Russian Imperial Honorary Consul in Brisbane from 1908 to 1917. Naldham House was home to the Brisbane Polo Club from 1994, after extensive alterations, hosting conferences, weddings and other functions. It was recently sold to the owner of adjacent Waterfront Place, and at the time of writing is undergoing renovations. As it is listed on the Queensland Heritage Register, I'm sure it will retain its place as a fine example of late nineteenth-century maritime buildings with an imposing architectural presence. 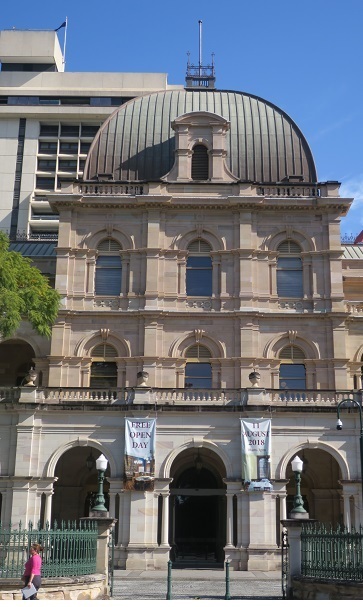 Parliament House, located on the corner of George and Alice Streets opposite the City Botanic Gardens, is one of Queensland's most beautiful and significant buildings (which cannot be said of the monumentally ugly adjacent Annex). It was designed by Charles Tiffin, the Queensland Colonial Architect at the time. Our Parliament has met in these halls of power since 1868. The impressive architecture is capped with an unusual "square-domed" roof (domes typically have a round base). 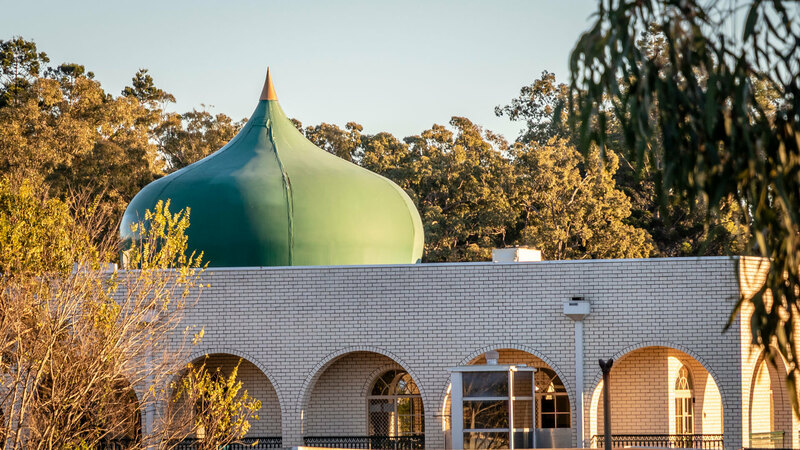 The original zinc roof was replaced in the 1980s with one constructed with Mt Isa copper. Parliament House is celebrating its 150th anniversary in 2018, including a free Open Day. The Sir Thomas Brisbane Planetarium is located within the picturesque grounds of the Brisbane Botanic Gardens at the base of Mt Coot-tha. 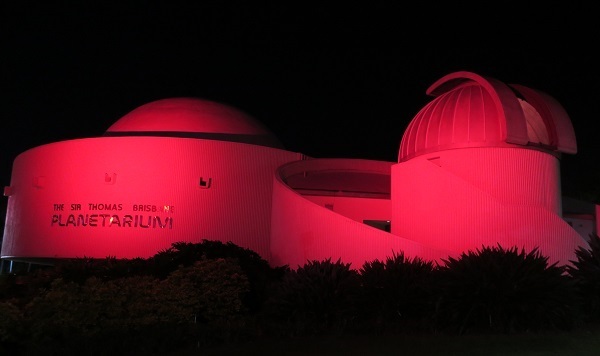 The Planetarium was designed by Brisbane-based architect William Job, who was named Queensland Architect of the Year in 2001. It officially opened in 1978 and enjoyed its 40th turn around our sun in 2018. It is named after Sir Thomas Brisbane, Governor of the colony of NSW from 1821 to 1825, who was a well-known Scottish astronomer. The Planetarium features a 12.5 metre diameter Cosmic Skydome, which is a hemispherical planetarium theatre. It was recently upgraded with a state-of-the-art Sky-Skan digital dome projection system which shows the Brisbane night sky with stars, constellations and planets. This gleaming BRIGHT WHITE presence is often illuminated at night in a rainbow of colours. Did you know that there is a crater on the moon and an asteroid both called Brisbane? The Parish of Vladimir Icon of the Mother of God was established in 1956 by a Russian immigrant. Reader Euphimiy Shishkoff built the original temple (which is still in situ) at 14 Douglas Road in Rocklea. The parish soon outgrew this small wooden building and a new church was constructed on the same site in the 1980s and consecrated in the 1990s. The modern church is still incomplete and numerous works are being undertaken, including reconstruction of the temporary decoration on the gilded cupolas or onion domes. 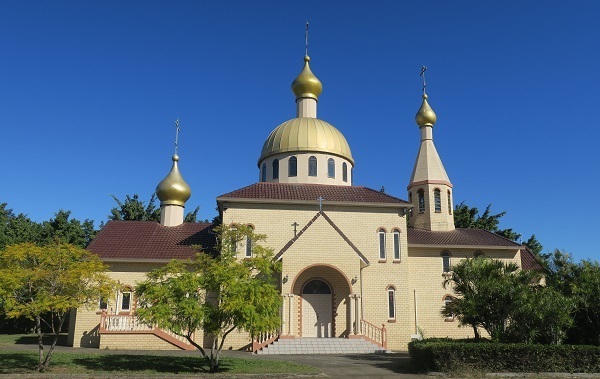 St Nicholas at 48 Bandara Street in Wacol was consecrated by His Grace Kyr Dimitrije, Bishop of Australia and New Zealand, in the year of our Lord 1977. Its architecture boasts a fine copper cupola which appears unexpectedly in the near-rural landscape. The Islamic Society of Darra Inc was formed in 1983. Its Darra Mosque was subsequently relocated to its current site at 219 Douglas Street in Oxley. Its beautiful large verdigris copper dome dominates the suburb. A minaret is a slender tower, typically part of a mosque, with a balcony from which a muezzin calls Muslims to prayer. They generally have a tall spire with a conical or onion-shaped crown. 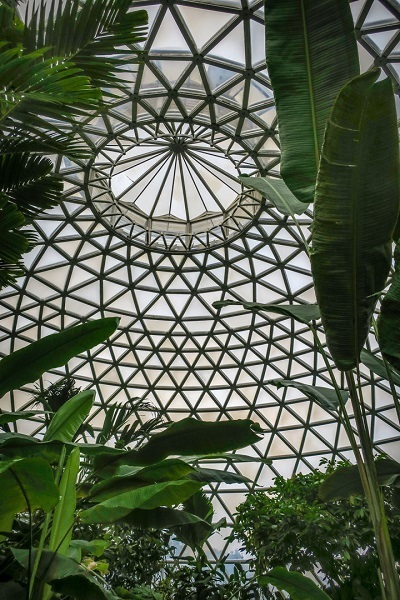 The Tropical Display Dome at Brisbane Botanic Gardens at Mt Coot-tha is a large lattice structure or geodesic dome displaying plants from the tropics. A geodesic dome is a hemispherical structure developed by R Buckminster Fuller. The triangular elements of the dome are rigid and distribute the structural stress enabling them to withstand heavy loads for their size. A pathway winds upwards through this dome building, wrapping around a central pond with water plants. 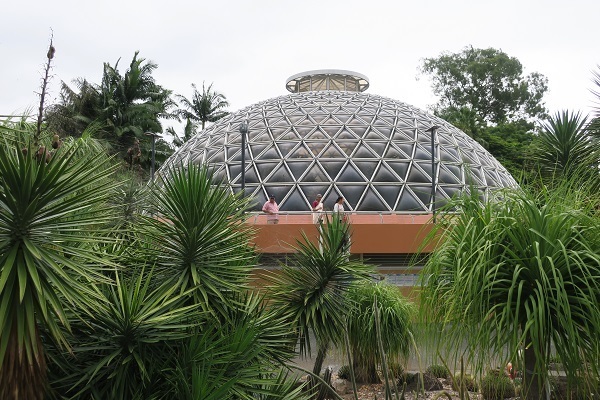 The dome provides a climate close to the natural growing conditions for tropical plants that wouldn't normally grow in Brisbane. The Tropical Display Dome which is 28 metres in diameter and 9 metres high, was opened to visitors in 1977. Although Customs House calls its pop-up structures "igloos" they are actually geodesic domes. An igloo is a dome-shaped shelter built from blocks of solid snow, traditionally used by Inuits. Yes, they are dome-shaped and are a form of shelter but they are made from plastic, not snow! 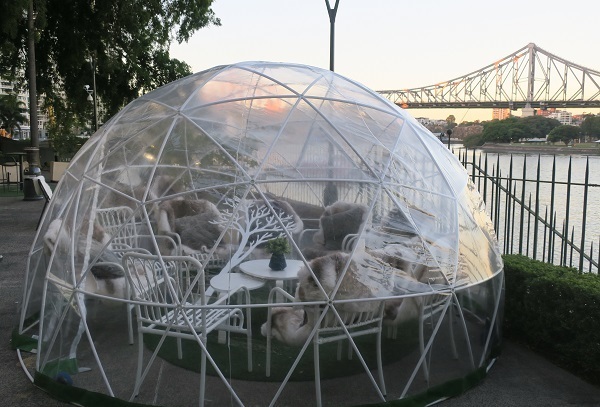 The sentiment is that they will protect the incumbents from the chilly winter breeze on the river while still offering a grand view of the Story Bridge: a delightful domed drinking spot. Eagle Street Pier has had a colourful history over the past 150 years. While the area is now a fine dining precinct, in the 1800s it served as Brisbane's main wharves. It was owned by the Australasian Steam Navigation Company, who built nearby Naldham House. In their final years, the wharves were used for car parking and eventually demolished to make way for a new development. The area underwent renaissance when Eagle Street Pier was built in 1989, transforming it into Brisbane's premier riverfront dining precinct. The complex has distinctive bright white domes, but it has been suggested that they be painted or undergo a colour change with lighting. 12. What is my favourite dome in Brisbane you may ask? 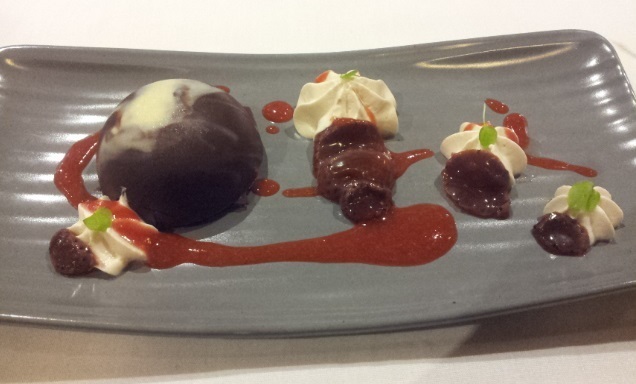 It is the extraordinary Chocolate Dome dessert with Chantilly cream and strawberries, at Cha Cha Char restaurant. You'll find it beneath the domes at Eagle Street Pier. Where is your favourite dome? I'd like to also know which domes I have missed. I'm sure there are many more beautiful domes out there which I haven't yet photographed. Happy dome hunting. What a nifty idea for an article! The Dome at the Botanic Gardens is one of my favourite places. 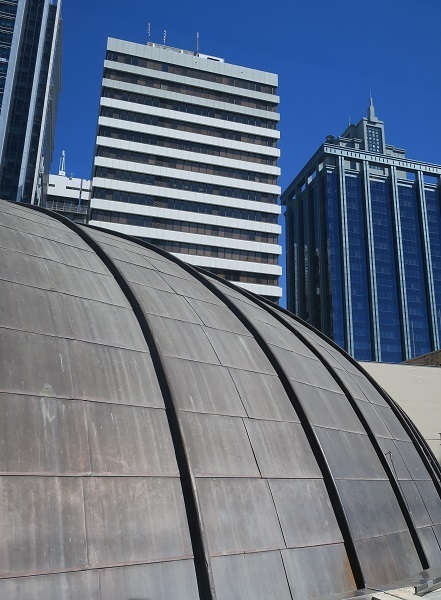 Theres a big dome atop the Marriot hotel on Adelaide St...I've always wondered what is underneath it! 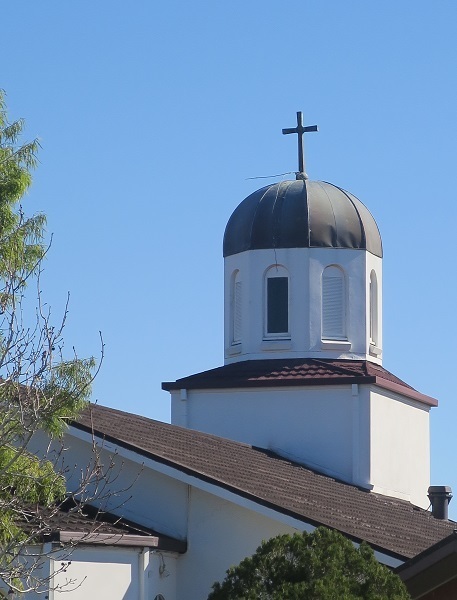 There is a big dome on the Catholic Church in Bage Street, Nundah. You can see it from kilometres around, it is so big. Great to include in this list.